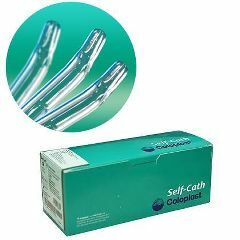 The Self-Cath Plus Coude Catheter is a member of the Self-Cath Plus family of 100% latex-free hydrophilic catheters that offers patients a variety of options for intermittent self-catheterization. The Coloplast Self-Cath Plus Coude Catheter is a traditional hydrophilic-coated catheter. Add water to activate the lubrication. Hydrophilic coating offer lower friction than uncoated and gel-lubricated catheters lowering the long-term risk of damage to the urethra.